Are all unmarried women without honour which they can only salvage or reclaim after becoming someone’s second, third or fourth wife? What kind of society have we become where the only course of security of a single woman is to become someone‘s second, third or fourth wife. Ms. Hayat's contribution to making life more secure for Pakistan's downtrodden female population doesn't stop here. Recently she lead on a legislation to make use of mobile phones expensive for the youth in the province so that they are unable to chat/text each other at night thus saving their morality. Ms Hayat believes that a chastity belt of laws making communications among youth prohibitively expensive will save Pakistani girls from "harassment" through unwanted texts and calls. Unfortunate thing is that stupid proposals like these two were able to gain cross party support in the provincial assembly demonstrating how out of touch with reality is the current political leadership. What's more unfortunate is that fact that this is happening under a provincial government that boasts to be better enlightened and efficient than others in the country. It was 18 years ago, on 20th February 1992, that one of the greatest Muslim scholars of the 20th century, Muhammad Asad passed away. He was the most prominent rationalist (Mu'atzillah) scholar of the 20th century. His major contribution to Islamic literature is his translation of the Qur'an into English, one of the most readable one that is famous for its chaste language. I wouldn’t write about his life because you may find biographical information on him easily, on the Internet. I feel honoured that he chose to be a Pakistani citizen. He was one of the first to be issued a Pakistani passport (Pakistanis used British passport in the early days but Asad refused to receive one as a Pakistani citizen). After the creation of the state of Pakistan, he was appointed Director of the Department of Religious Reconstruction and was charged with the responsibility of making recommendations for an Islamic constitution for the state of Pakistan. Some of his suggestions were made part of the Objectives Resolution – actually he is credited with drafting the resolution that was passed by the Constituent Assembly in 1949 as a preamble to the Constitution. He was appointed Pakistan's Minister Plenipotentiary to United Nations. In 1952, he resigned from the Foreign Service. In 1954, his autobiography, Road to Mecca was published from New York. The book was an instant success. It describes the spiritual journey he went through and is written using the 'stream of consciousness' technique. It narrates simultaneously three journeys made at different times and describes the post WWI Arabia. As an historical adventure it echoes T.E. Lawrence's Seven Pillars of Wisdom The first chapter of the book equals if not surpasses in its description of desert life, the works by Thesiger. In 1980, Message of the Qur'an (translation of and commentary on the Qur’an) was published. It was criticised by the orthodox scholars for its over-emphasis on rationalist interpretation. 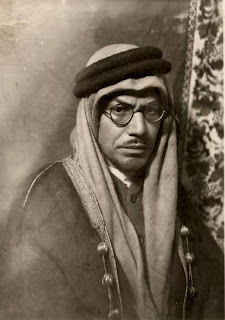 Asad too became very critical of the ways of Muslims in the later half of the 20th century. Just before he died, he is said to have remarked, "I fell in love with Islam but overestimated the Muslims". I'm sure with a growing need to rediscover reason in faith; the time is not far off when Asad's status as an ardent rationalist will be recognised among the Muslims in the East. 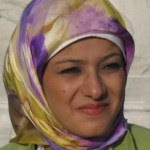 In response to an article on this blog by Aisha Alvi "The Hijaab: 20 years on" a reader posted a comment attempting an intellectual discourse on whether the Hijaab is a matter of personal choice or religious compulsion on Muslim women - a view promoted by western media and traditional religious establishment across the Islamic world alike. I personally could not let their views hide among the comments section and have decided to post them here. I would like to apologise in advance if any of my arguments below seem to challenge some of the convictions that have been so profoundly inculcated in the subconscience of a majority of the Muslims including almost all my family - my mother wore a burqa all her life. I’m no expert in Islamic law and my knowledge is only superficial. Generally I agree to the point that Aisha has raised, however, I’m not comfortable with one point that I would like to highlight here. Starting with the first source, the Qur’an is essentially a book of theology. Its main objective is to establish beyond any doubt the oneness of God; He alone is sustainer of this universe and from time to time He has sent his messengers to guide human beings of whom Muhammad (saw) is the last one. However, it has given some clear injunctions regarding personal law, e.g. marriage, divorce etc. In Medina, when the Prophet became a head of the state, it was deemed necessary to protect his household from direct and easy access by everyone. It is not regarded as a clear ruling to make hijab mandatory for Muslim women. It is significant that this regulation does not require that the women should first wear a headscarf and then pull it down to cover her body. They should wear an article of clothing that should cover their bosoms. In olden times, this article of clothing would generally consist of a large head covering that could be used for this purpose. A casual reading would inform us that the focus is on covering the bosoms and hiding those parts which one may class as having physical charms. The Qur'an does not clearly define what these physical charms precisely consist of. It is very sensible regulation because it takes into account that from period to period and culture to culture what constitutes physical charms varies greatly. A teacher of mine in Pakistan used to say that if a red shawl is wrapped around a thorny bush, the college students will circumambulate it indefinitely. On the other hand a women's face and hair might not be as seductive in certain cultures. A clear injunction is not available and the interpreters have never failed to play their favourite game. Saudi version favours imposing far more stringent measures than some other interpretations. Sahih Bukhari describes in some detail the historic occasion of ayat al hijab (hadith 6315). A tradition related by Aisha (ra) in Sunan Abu Dawud is often cited by pro-hijab scholars but some others have not considered it sufficient enough evidence. Seeking to follow or emulate the wives of the Prophet (saw) is of course good practice but I have issues accepting it as an obligation. Some scholars think that the rationale of the clothing regulations can be served without covering the hair. A vast amount of what is considered Islamic Law comes from Fiqh. Scholars when they did not find clear rules in either the Qur'an or the Hadith literature, set out to compile Fiqh using Usool Fiqh (jurisprudence). Now it is very important to consider that Usool Fiqh varied considerably and hence there are different schools of thought in Fiqh. A few elements of Usool Fiqh were 'ilm al qayas (deductive reasoning), ijma' (consensus) and ijtihad (analogy). The scope and acceptability of these principles varied greatly, e.g. Hanafi School was relatively liberal. It allowed the scholar to use 'ilm al qayas but the Maliki and Shaf’i schools were very strict. They allowed ijtehad in a restrictive framework. So did Hanbali school. Shi'ia scholars believed in the concept of imamate and no consensus is acceptable unless it is endorsed by the imam. Some of the sayings of imam were given the weight equivalent to that of Hadith. Mind you imam is infallible interpreter of Islam in Shi'ism. Due to the differences in Usool fqh, the codification carried out by the different schools had considerable differences. The issue of hijab is not an exception. The problem if that an ordinary Muslim faces a large body of Fiqh and considers it as infallible interpretation of Islam. With this detailed background, I come straight to the issue that caused me discomfort - to say that hijab is indispensible for a Muslim woman is actually imposing the opinion of one group (albeit a large one) upon all Muslims. It would be more accurate to say that ‘according to the interpretation of a large number of Muslim scholars, hijab is an essential part of a Muslim women’s dress but many scholars have differed with this from the beginning’. This approach does not consider Mu’tazila view point at all. There was only one human being whose understanding of the Qur’an was infallible. Unfortunately he died in 632 A.D. and now there is no way to decide which interpretation is correct or otherwise. There may be different shades of truth. Of course those interpretations that violate the clear injunctions of the Qur'an and Hadith are easier to make judgements on but unfortunately we face a situation where things are rather complicated. Having said that if you believe that hijab is mandatory for Muslim women, you have the right to maintain that and should be allowed to wear one. For me, it is not an essential part of a Muslim woman's dress code but everyone should be free to choose what they want to wear. I do respect those women who wear hijab for the simple reason that they are going an extra step to remain compatible with Islam. I will fight for their right to wear hijab but would not be able to accept that this is mandatory. Actually Islam does not conform to the zeitgeist. That’s fine Islam is not a fashion, it can wait, as stated by Dr Murad Hofmann. Why all this to Islam? Europe’s first encounter to Islam was one of enemy and that has not completely disappeared from the collective memory of Europeans. A few good readings on the topic are Albert Hourani’s Islam in European Thought; Professor Edward Said’s Orientalism; and Covering Islam. Even those publications that first appeared in the early part of the 20th century or before and highlighted favourably the Muslims’ literary contributions have been gradually replaced with those which look down upon Muslims as barbarians. Jack Goody’s The Theft of History is another good read. It is ironical that women showing their body are only exercising the personal freedom that the great civilisation has conferred upon them but those who want to cover their hair violate the very value. Why does personal freedom is cherished in one case and frowned upon in the other? I dedicate this short piece to my late father, Dr. Abdur Rab Alvi, 1929 -2006 (may Allah forgive him). The dedicated support and guidance through our long drawn out hijaab fiasco was exemplary of what a Muslim should be; he displayed humility, tolerance and gentility. He was a Consultant Ophthalmologist by profession and a graduate of King Edward Medical College Lahore. As one of the pioneers of the Muslim community in Manchester, he established the first purpose built mosque – Victoria Park Mosque and worked on many other community projects throughout his lifetime. He leaves behind a wife and seven children. Aisha Alvi, Barrister at Law, LLM (Islamic Law) University of London, aims to use the privilege of her training not for personal gain, but to show the wisdom of the Shariah. Recently, her expertise in Islamic law and the English legal system has led her to be involved as a key advisor in several anti-terror prosecutions. Her expertise in the Islamic law of transactions has also allowed her to become a pioneer in the development and promotion of Islamic wills. I am neither a fan of Bollywood movies, nor a follower. But I am going to cinema this weekend to watch latest movie by Shah Rukh Khan "My name is Khan". This is not because I have suddenly developed an interest in Bollywood. It will be because I stand against fundamentalism in all its forms. Whether it is Islamic fundamentalism Taliban style in North of Pakistan or Hindu fundamentalism in South of India. I will watch the movie (might not enjoy it BUT watch I will) in support of Shah Rukh Khan the actor who has come out to be a Man in his recent battle with Hindu fundamentalism in Bombay. Shah Rukh Khan is paying the price for speaking out against what I believe is the Hindu fundamentalist hegemony in an apparently secular India. He spoke out against what was a shameless display of racially, religiously and politically motivated discrimination against Pakistani cricketers who wanted to play in the Indian Premier League. On pressure for certain quarters in India none of the Pakistani players was selected to play the league. I would rather they don't play the league in the first place. Do we love them? I think we immensely love them. And why do we suddenly jump up and say this is not good? I think we are being misled by a lot of things people say about us and them. And I truly believe that they should have been chosen. Fascist Hindu fundamentalist party Shiv Sena have taken it upon themselves to teach Shah Rukh a lesson. They have sent letters to cinema-owners in Bombay, ordering them to remove posters of Shah Rukh's forthcoming release, My Name is Khan. Cinemas have also been warned not to screen the Karan Johar-directed film, scheduled for release on Friday, February 12 (i.e. today). Threat of violence is keeping the movie goers away and cinemas empty - many of whom refused to show the movie in the first place. He is apologetic to his commercial partners. I would like to apologize to Karan Johar (the director), I apologize to Kajol and I'm immensely sorry to all our business partners that because of what I say or what I believe in the film and the work is going to be affected. 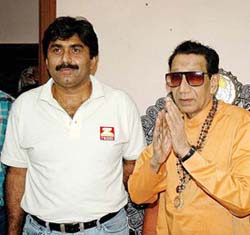 Remember that not long ago Javed Miandad had to go and meet the Goon in Chief of Shiv Sena to seek permission on behalf of the Pakistani cricket team to play in Bombay. Photographic evidence attached. I am going to be one of those who will contribute towards making sure that Shiv Sena's goons don't make him suffer financially. I am buying a ticket and watching the film. You are the Khan, Shah Rukh. The fashion model president of Afghanistan Hamid Karzai wants to bring in conscription to the war torn country to make the Afghan army large enough for him to manage the country beyond Kabul (the presidential palace really). He wants a 300,000 strong Afghan army by 2012 so that his security is "no longer a burden on the shoulders of the international community". It is public knowledge that President Karzai and his cabinet of crooks has survived last few years under the protection of US Marines. Had he left the security in the hands of his Afghan comrades he and his ministers would by now either be trying to bribe an exit out of hell or would be back living in their villas in Quetta. Afghan government does not need more soldiers, let alone conscripts. It needs loyal soldiers that serve and protect a credible government backed by its people. Majority of Afghan soldiers are not in it to serve the "queen and country" but for economic sustenance that is not available to common Afghans. They lack the pride that soldiers serving a sovereign state carry and that makes them give their lives to save the motherland. Unfortunately, for Afghanistan that pride and passion appears to be among those who are fighting the occupation, or among the terrorists - don't mix the two. Not every Afghan is a terrorist - we must realise that picking up arms and giving life to fight against tyranny and especially foreign occupation has been a favourite Afghan past time for centuries. Invaders and their puppets just don't learn from history, do they! General Kayani, head of Pakistan army recently concluded that "until the Afghan government improved its credibility and governance record and until the Afghan population began to change its perception that Isaf is not winning, the Afghan government would not be able to establish its writ and the local Taliban would not be “weaned off”. I believe that president Zardari has reached the end of his tether watching commoners in Pakistan having a laugh at his expense. His recent outburst asking his minions who were not keen to listen to his speech to "Shut up" was in full media glare and has been one of the most watched short video clips on You Tube. Like many other dumb moves to censor free speech the government decided to use the heavy handed approach and censor You Tube itself. Apparently the president has had enough. "About 90 minutes ago, YouTube suddenly got blocked in Karachi – with the message “This site is restricted” popping up instead. PTCL expressed ignorance about the ban, whereas representatives of various ISPs’ helplines said that Pakistan Telecommunication Authority had banned YouTube. At around 9:30 PM PST, YouTube came back, but now one cannot access the video of Zardari saying shut up to a crowd that surfaced recently on the website. Since its a Sunday, PTA representatives are unavailable. This move comes just when one thinks the Government of Pakistan cannot outdo themselves. What’s next, a ban on free speech?" "Democratic" government in Pakistan keeps on forgetting that despite all its bearded problems Pakistan is still far from a closed society like China or Iran where the authorities can get away with controlling public voices through violence, state oppression or sheer economic might (like Google caved in against Chinese state control). China and Iran boast one of the most thriving blogger communities simply because repressions rebels. Tyrants (and Zaradari is a wannabe) must fear rebels who can talk and are listened to.